Walking may be the perfect exercise. It requires no special equipment other than a good pair of walking shoes and it can be done by nearly anyone, at any fitness level. "Walking is the least expensive exercise modality to start and maintain," says Irv Rubenstein, exercise physiologist and founder of Scientific Training and Exercise Prescription Specialists (S.T.E.P.S.) in Nashville, TN. “Walking also helps control blood sugar, improves cardiovascular health, reduces bone loss and improves mental health." 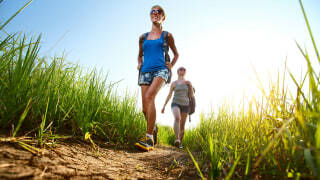 According to a study published in the International Journal of Epidemiology, walking just 30 minutes a day, five days a week can even help you live longer. But to really benefit from a walking routine, you need to stick with it and constantly “find ways to challenge yourself,” says Tom Holland, exercise physiologist and author of "Swim, Bike, Run—Eat." Here’s how you do that! A heart rate monitor helps you track your effort by measuring your exertion. “Most people don’t workout nearly as hard as they think they do,” says Holland. Wear the heart rate monitor for a few workouts to find your average heart rate. When you work out, you should be striving for five to 10 beats above your baseline, suggests Holland. Interval training involves alternate bouts of more intense exercise with lower-intensity periods. These short, higher-effort bursts burn more calories than working at one intensity for the same amount of time because of an “after burn” effect called EPOC (excess post exercise oxygen consumption). You actually wind up burning more calories after the workout and for a time afterward! Here’s a sample routine: Alternate between 30 to 60 seconds of higher intensity (speed walking) with 60 seconds of slow to moderate exertion (walking at a normal pace). Use your heart monitor to help you gauge! Don’t do intervals every workout, says Holland. Aim for three longer, endurance days and 2 shorter interval days. Walking faster instantly boosts calorie burn. For weight loss, you’ll need to do more than stroll. For example, a 150-lb woman walking slowly at 2.0 mph burns approximately 72 calories per half hour. If she picks the pace up to 3.5 mph (a moderately brisk pace), she burns 136 calories for the same time. If she walks a very brisk 4.0 mph, she burns nearly 180 calories. And if she picks it up to a light jog at a 5.0 mph pace, she burns a whopping 286 calories. If you have difficulty increasing your walking pace, find a hill or two—or an incline if you’re on a treadmill. Adding difficulty in any way will help up the calorie burn. “If you walk on an incline treadmill avoid hanging on to it or you’ll take away the benefit,” says Holland, referring to a common bad habit. Holding on to the treadmill railing reduces calorie burn by allowing the machine to support your body weight, says Holland. For more of a challenge try hill intervals: power your way up the hill and walk down; repeat several times. A walking partner can add friendly competition, as long as you avoid turning your walk into a lazy social hour. Keep up the pace by turning your intervals into a game: Alternate picking a goal (like a mailbox, telephone pole or other landmark) and race to it. Winner gets to pick the next go-to object. Try different trails and walking paths to add variety and increase the walking challenge. Using Nordic walking poles gets your upper body into the action, which increases calorie burn, says Holland. Several studies show using walking poles also reduced impact on the knees and increased walking speed because it provides less perceived exertion (meaning, it feels easier without actually being easier). Proper way to use walking poles: Firmly position the pole at a 45-degree angle behind you, then push back strongly against the ground to propel yourself forward. Light hand weights add some resistance and calorie burn to your walk, but ankle weights are not recommended. “They change your natural gait,” says Holland.